This past Saturday, Capcom was kind enough to invite me over to their offices to play around with Bionic Commando: Rearmed, provided I was able to avoid their security force of zombies and Zangief. I got through alright, but I can't say the same for some of the other journalists. I'll just let their zombie forms go on and blog in anonymity. Chad got his hands on the game back at GDC, and wasn't exactly the happiest camper in the world. It had been a while since I played the original Bionic Commando -- I was probably eight at the time I first gave it a shot -- so I took Chad's words very solemnly as I was going into things. I mean, if I'm getting doubts from some of the RetroForceGO! crew, then I need to be skeptical. First, we got a chance to play around with the game, both in single player and co-op mode, in order to get a feel for the game. Dyson had said to me, "If you aren't swinging around like a monkey within 20 minutes, they're doing it wrong." Well, right off the bat, I can say that I had absolutely no problem with the swinging mechanic, and was fairly used to it within five minutes. The controls presented me with very few problems, which was a relief, considering I'd have to be utilizing the swinging mechanic for everything in the game. For the most part, I figured I'd be set for what they'd be showing off: the multiplayer. Now, before I get into this, there's a big thing everyone needs to realize about Bionic Commando: Rearmed. There is no online for the game. Co-op, multiplayer, etc. are all offline. Achievements, leaderboards, and all that stuff are included in the game, but you can't just stick in the code for online functions once the game is done. Ben Judd, the producer for BCR, said that they only decided on co-op about halfway through developing the title, and so there was no way to introduce online -- the entire engine had to be built around online in order to do so. On a quick side note, we got to see the scene that got Bionic Commando: Rearmed an M rating. "Five seconds of footage that eliminated 33% of our audience." Bionic Commando fans will not be disappointed in the least. Anyways, let's continue on. 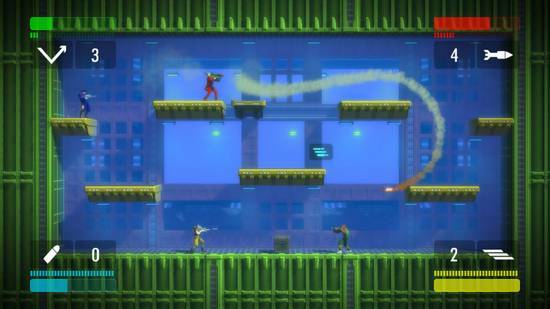 In BCR, there are three modes in the multiplayer: Deathmatch, Don't Touch The Floor, and Last Man Standing. Deathmatch and Last Man Standing are your standard fares. Don't Touch The Floor is another mode that focuses on knocking the opponent off of the stage. Bullets and grenades don't do any actual damage, but knock your opponent back instead. 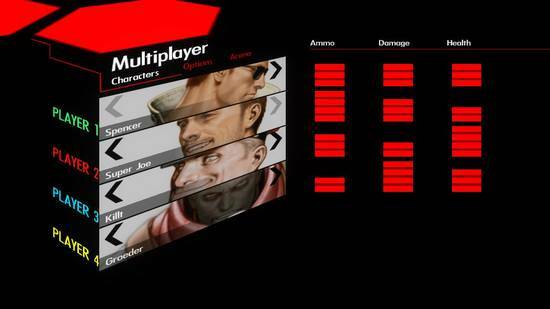 As per usual multiplayer games, you've got the option of adjusting the time and kill limit, as well as setting teams. Now that I was thrown into multiplayer with the other journalists, and Gearoid from Capcom, with the expectation of fending for myself. Right off the bat, I was having fun. I had to get used to swinging around and running under pressure, but things came to me fairly quickly. I was getting used to the controls fairly quickly, and only running into problems with the 360's D-Pad. I would be attempting to crouch and fire at someone, only to have the character turn around and start firing in the opposite direction. The bionic arm mechanic is such an unbelievably important mechanic in this game, that it's kind of hard to congeal into a coherent sentence, but I'll give it a shot. I figured using the claw would be akin to jumping, and that it'd be something that I'd get used to after just a little while. And sure, I did. 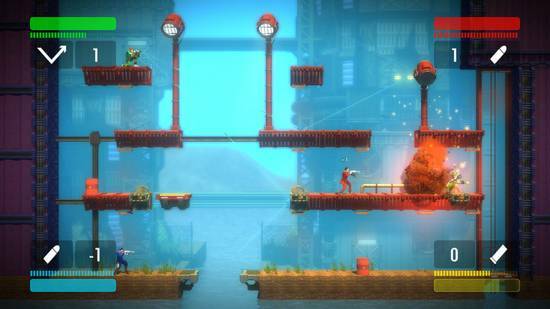 I was able to swing with relative ease after a few minutes, and could move about the level as I pleased. Yet, I also have to use the claw to pick up power-ups. Alright, that's fine. "Oh, by the way, you can block bullets with the claw." Thanks, Ben. You just added one more thing for me to have to learn how to do. By the end of the hour or two we spent on BCR, my arsenal of techniques was now formidable, but with that, things became ever so slightly more complicated. It wasn't just about swinging around and pressing the fire button. Now I had to do a ton of thinking about where everyone was. When Ben took the controllers from us, I was sad. I wanted to keep playing. 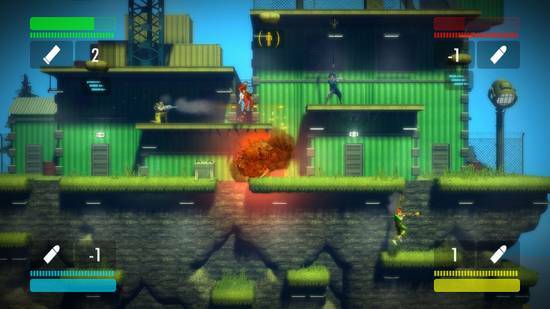 Not only because Bionic Commando: Rearmed was a fun game, but also because of the feeling that had been created between all of us playing the game. It was just like playing with my friends back home, all in the same room together, all sharing the same experience.